Clwyd 8 holiday caravan at Quay West in New Quay, Wales. This well equipped double glazed and centrally heated 3 bedroom (bed linen provided) Willerby Bermuda Deluxe Caravan is located in Quay West Holiday Park in New Quay within easy walking distance of Traethgwyn Beach and the picturesque harbour of New Quay. This caravan sleeps up to 8 with a double bedroom and two twin bedrooms, plus sofa bed, open plan sitting / dining / kitchen and a timber deck area . Dolphin watching, beaches, boat trips, fishing trips, water sports, diving and a variety of pubs and restaurants are all available nearby. Up to 2 small well behaved dogs welcomed. This is a well maintained Deluxe 8 berth family caravan with large open plan living, kitchen and dining area so all of the family can be together plus a fully enclosed and gated timber side deck with views overlooking Cardigan Bay. The deck is ideal for enjoying a glass of wine in the evenings with outdoor table and chairs for six. A high chair is provided at this caravan. The kitchen is well equipped and has a gas cooker with grill, microwave, toaster, kettle, family size fridge / freezer, and plenty of cutlery, crockery, glasses and cookware. The main living area and one of the twin bedrooms have flat screen TVs . With double glazing and central heating so it is always warm and comfortable all year round. There is a shower room with shower and washbasin and a separate WC with washbasin. There are 3 bedrooms, with the master having a double bed and the other two rooms having two singles in each. There is also a pull out double sofa bed in the living area. Each bedroom has good lighting and plenty of storage space. The duvets and pillows are provided, bed linen is provided but towels must be brought by the guests. There is a designated parking bay for one car close to the caravan. Other parking is nearby. Please note that passes will need to be purchased on arrival from the main park reception desk in order to enjoy the site facilities. Please note this is a non-smoking caravan. 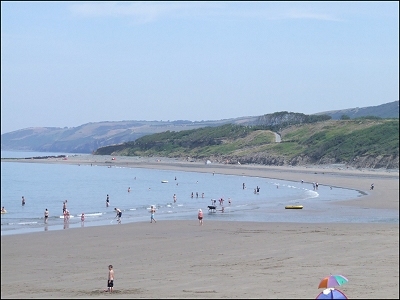 There is footpath access to Traethgwyn Beach below the caravan and it is also within easy walking distance of the main park facilities. New Quay is a short walk along the beach. 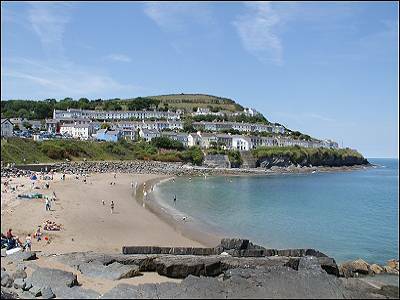 New Quay is a special place from the sandy beaches to the pretty harbour. High season its a busy seaside town full of pubs, shops, cafes, and restaurants. 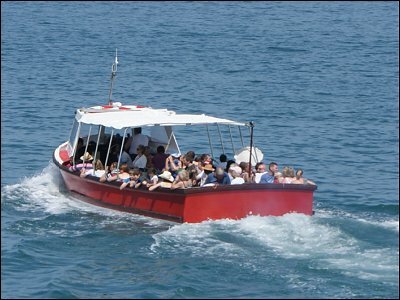 there are fishing boats, dolphin and seal spotting trips, kayak hire plus lots more. All you need in a holiday in one of the best locations in West Wales.